Eric Metaxas is an excellent biographer. This book is no different. 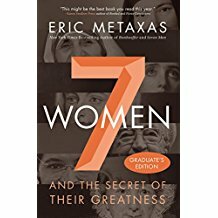 I enjoyed hearing about these seven extraordinary women and why he decided to include them in his book. Each of them are a great inspiration in varying ways. Joan of Arc - It's almost unbelievable what she accomplished as a young woman - a teenager!! She heard from God numerous times and she was bold in her faith and leadership. She exhibited great bravery as she donned men's attire and led armies into battle. She was falsely accused and wrongfully treated, and was martyred for her faith. Susanna Wesley - She endured much heartache and hardship in her life, yet she was always faithful to her Lord and Savior Jesus Christ. With her husband Samuel, she had 19 children (9 of which died as infants), whom she homeschooled and raised with biblical principles. Some of her children are well-known, including sons John and Charles Wesley, who are known as founders of the Methodist Church. Hannah Moore - I had only known a little about Hannah before (from a movie about William Wilberforce), so I was enlightened of her influence in her time and the crucial part she played in abolition. St. Marie of Paris - I had never heard of this woman before so it was a delight to learn of her heart for the poor, how she loved others and how she helped people find faith in God. She had great humility and was kind to others. She saw in each person a reflection of God. Corrie ten Boom- She is a beloved and well-known woman of faith, whose family helped hide Jews in their home in Holland during the invasion of Nazi Germany and Hitler. Their family's hiding place was eventually found out, and the family members were sent to prison. Corrie endured much suffering in prison and concentration camps, but never lost her faith in her dear Savior. Along with her dear sister Betsy she prayed and evangelized even under the worst conditions. Eventually she was released from the camp through a clerical error, just a few weeks after Betsy went to be with the Lord. One time after she had spoken to an audience, a former guard at the prison camp came up to shake her hand and ask for forgiveness. He was now a Christ-follower and was sorry for his sins. It was the hardest struggle of her life, but she did end up forgiving him and shaking his hand. Rosa Parks - Rosa was raised in a Christian home and she had learned to trust in God at an early age. Scripture and hymns helped her keep faith during difficult times. As de-segregation was slowly coming about in America, she as a member of the NAACP was a civil rights activist. She is sometimes known as the "The mother of the civil rights movement". She was the token black person who did not give up her seat on the bus to other white people, but "stood" her ground and stayed seated. She was arrested for her actions, but this sparked much upheaval. Because of her bravery, many laws were changed and culture began to change as well. Mother Theresa - She was such a dear lady of humility and service and love. She truly followed the new commandments to love God and love people. She especially had a heart for the poor, for the sick and dying, and for unborn babies. She lived and worked on the streets of Calcutta, India serving the poor and homeless.